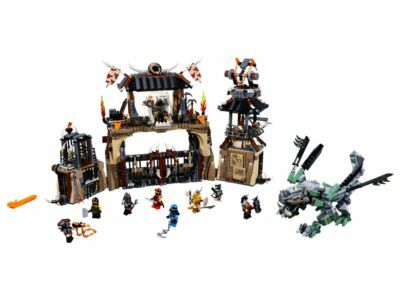 Dash to the LEGO® NINJAGO® 70655 Dragon Pit with the ninja heroes and free the dragons captured by Iron Baron and the Dragon Hunters! Dodge shots fired from the watchtower’s rooftop dual missile shooter. Protect Dragon Master who is wearing the full Dragon Armor. And beware— the jail has a trapdoor to drop ninja heroes into the pit with the ferocious Earth Dragon, while evil Iron Baron watches from his throne! Price is 36% below the initial Lego retail price, a € 53.99 discount! This comes down to 5.78 cent per brick. The Dragon Pit (70655) Lego set is available from the sites below. However, they do not offer delivery to your selected region. The Dragon Pit (70655) Lego set is no longer directly available from the sites below. However, 3rd party partners of these sites might still have the set available. Alternate description Dare to enter the Dragon Pit!